Canning is a preserving process that allows you to enjoy fresh produce (and even meat) for months to come. There are two main ways I know of canning: pressure canning and water bath canning. For pressure canning, you need a pressure cooker. Since I don't have one any more, I will show you how to water bath can. For me, this process is a little easier anyway. I've used the water bath canning method to can strawberry jam, salsa, bruschetta, and I hope to can some apple sauce next week (stay tuned for that upcoming post!). Step 1: Prepare the jars and equipment. 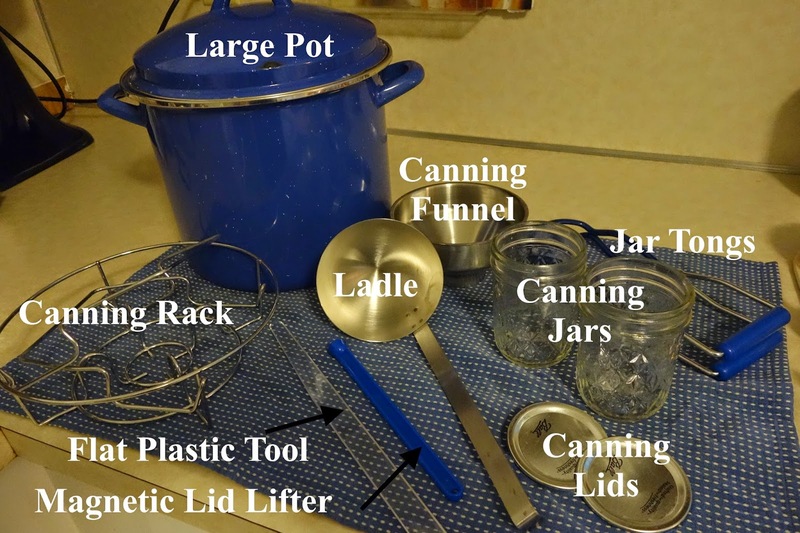 If you don't know someone to borrow the canning equipment from, you can purchase a starter kit for a reasonable price from Ball or on Amazon. Place all the cleaned equipment on top of a towel to dry. Step 2: Prepare the contents. Tomatoes ready to be canned. As I mentioned, I've water bath canned a few things, and I get most of my recipes from Ball. It's important that you use a recipe specific to canning. Canning recipes require a certain pH level. If you can a non-canning recipe, harmful bacteria may ruin the contents of the jar and inadvertently cause illness. So, be wise; use a recipe specific for canning. Step 3: Prepare the lids. You will notice a rubber ring around the inside of a canning lid. This ring softens and acts as a seal when heated. To begin the softening process, place the lids in a bowl and poor hot water over the lids. Allow the lids to soak for a few minutes before placing them on the jars. Use the magnetic lid lifter to remove them from the hot water. Step 4: Fill the jars. Using a flat plastic tool (or butter knife), remove the air bubbles from the jar by swiping the knife around the inside of the jar. Wipe the jar rims with a clean paper towel or cloth to remove any residue. You want a clean surface so the lid seals to the jar properly. Step 5: Place lids on jar. Center the hot lid on the jar so that the seal matches the rim of the jar. Screw the metal band until the band is "fingertip tight", meaning not too loose and not too tight. Step 6: Process the jars. Fill a large pot with water and bring to a boil. The pot should have enough water in it so that the jars are completely submerged under water (with about 1" of room above the lids). Bring the water to a boil before placing the jars into the pot. Carefully place the jars into a pot of boiling water using a canning rack. Leave the jars in the boiling water for the specified amount of time per the recipe. Step 7: Allow jars to cool. Carefully remove the jars from the pot of boiling water using the jar tongs and gently place them on the dry towel. Do NOT push down the tops of the lids to check and see if it's sealed. You will most likely hear the lids "pop" within 10-15 minutes of processing the cans; this signals the lids have sealed. However, wait up to 24 hours before touching the lids and moving the jars. Store the canned goods in your cupboards to enjoy for months to come! Use this canning method to can fresh produce that you want to enjoy year round. For recipes, visit Ball.